Raising Real Men » » Welcome to Our Party! We’ve Got Freebies and a Contest for You! Welcome to Our Party! We’ve Got Freebies and a Contest for You! “Boots and Saddles!” the cry rings out and the Youngs come running. We have long used the old cavalry call to tell our children to gather up, it’s time to “ride out” (get in the van and leave :-). I can’t even remember where we first heard it or when we first started using it, but it’s only one of a myriad of quirky things that we do just because we’re Youngs. We long for our children to serve Christ. We want them to share their hearts with us and to follow us as we follow Christ. We believe that building unity in our family will help us accomplish that. As our boys identify with our family and build happy memories, that the ties which bind them to us, we hope will go through us to the Lord. One of our workshop CDs shares a whole hour’s worth of ideas that you can do to have A House NOT Divided: Building Unity in the Family. Our friend, Felice Gerwitz, at Media Angels will soon be releasing a new book that sounds like a great resource, too. She’s sending me a copy to review and I can’t wait to read it! Do you sit at the side of a crib and wonder what your relationship with your child will be in years to come? Do you wonder what it will be like; will you have a communication relationship that has no boundaries? Or have the years slipped by too quickly, and you now feel like there is an impenetrable wall that goes up anytime you try to talk to your child? Join this mother-daughter team as they recount hilarious antics and reminisce about heartfelt moments that forged an unbreakable bond that would last a lifetime. Come along on their journey, as they take you step by step in how to build a bridge of communication with your children from an early age and how to mend and restore a broken parent-child relationship. Want a sneak preview? Today’s freebie is the Secret Code Time Relationship Checklist. Click here to download the checklist and do a check up on your relationship with your children! Want to read it before anybody else? 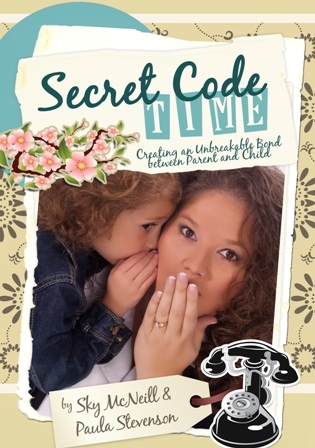 I am very excited to announce that Felice Gerwitz of Media Angels, the publisher of Secret Code Time has agreed to let us give away two prepublication copies of Secret Code Time! That’s right – you can get a copies before it is even published – just like the big magazine reviewers do! One copy will be given to someone who comments on this post. I’d love to hear what special things you do as a family to build unity with your children. And as always, you get extra entries for posting about this contest or Raising Real Men on your blog, email loop, forum, Facebook page, Twitter, anywhere on the web you like! I can tell you guys are spreading the word and we appreciate it more than you can know! Congratulations to: Randy K and Bonnie (I don’t have an email, Bonnie! Send me a note!)! Congratulations to Gaines Family and Rachel S! And congratulations to Joy Ellis, to whom we are giving a special gift! Joy has blessed us incredibly by spreading the word about Raising Real Men and our celebration! Thanks, Joy! Me! Me! Me! Me! Me! Lately I've been feeing like the un-fun parent and have been grappling for ideas to unify my 6 kids and get them hooked into my vision for an organized house and a fun homeschool. The one time that seems to be most unifying and unified is evening prayer and Bible story time in my bed. Often our days seem chaotic and filled with relationship challenges and personality conflicts. I think we all appreciate snuggling into the covers of the king bed to read Bible stories and pray. It brings a much-needed peace to our world. With my eldest (age 10), I am walking through a devotional. We are both learning great things about God through this devotional book, but I think what we cherish the most is the one-on-one time to chat about matters of the heart. Melanie and Hal, you are such wonderful people! I don't need a special gift! I am just trying to help you and your family out. You are an awesome family with a special message! Happy birthday to John Calvin! We are celebrating the birthday of our eldest son today also. 🙂 Our Joshua is 11, and I can hardly believe how quickly he's growing into an amazing young man. Many blessings on your family and what you do for families! We have started have game nights and movie nights with out family. We let the kids pick the games and movies, make popcorn and just spend time together talking. These books sound like wonderful parenting helps! Our greatest family unity comes from our family devotional time… singing and reading in God's word is the best thing we can ever do to bring our family closer, and for a more peaceful home! I commented on this over on my facebook page! I hope others will stop by and enter also! I would like to win this. I feel like I don't do enough to promote togetherness. We do have Family Movie Night. But I keep thinking there are probably more things we could do. Hi Hal & Melanie, You guys are incredible! Looking forward to reading your book and thinking I should save up & get a box shipped over to Oz for my KYB Mother's Group!! Now that we live near the coast DH built a canoe together with some guided 'help' from our 2 & 4 yr old boys. They love going to the beach/river and getting out in the boat and it is such a lovely family day out. Sometimes we even take the extended family!! We now have a little girl as well and have decided to start taking the kids out for special one-on-one time with each parent as well. We have established a family bible study with another family so that we are all together, instead of church groups such as AWANA where everyone is separated by age. It has been a wonderful experience and helps keep us united. I go grocery shopping every two weeks and I try to take a child with me. I rarely take all seven children. The kids literally argue over whose turn it is to go with me. They get to spend time with me and get to pick out where we go for dinner. They also get to pick out any box of cereal they want. I love the time we get to spend together. As for family unity – due to our schedule I am able to get a few hours alone with each child each week. This has allowed us to try and make it special for them (just that dedicated time sometimes soothes the soul), and then we all come back together as a family and sometimes play games or watch a movie together. Before we go to bed, we make sure we are having a family read-aloud time. This has been wonderful as it has opened the door to questions and time of sharing and growth and understanding of God's Word and his plans for our lives. Thanks for the reminder that we need to focus on family unity more. I don't know that I have anything to add that hasn't already been mentioned. We have morning devotions every day, but that's after Dad has gone to work. I take the kids out on “dates” (usually just grocery shopping, but it gives us one-on-one time) so we can talk without too many interruptions, but that's not ALL of us, now is it? We occasionally have a game night or a family discussion on topics of importance, but dinner time is when we really try to all sit down together and connect. I think we could use some fresh ideas to get us all on the same page. Thanks for the free checklist! When our children were all little we started taking the birthday child out by themselves. Sometimes it was just one parent sometimes both. We did whatever we could afford at the time, ice cream, happy meals, or just to run and errand, but the child got to spend uninterrupted time with us. One of our adult children has commented that this was a special time. We still try to take out the unmarried ones as well as the youngsters at home. Wow! What wonderful sounding resources. I think homeschooling is one major way that helps encourage family relationship. And another is working alongside each other – whether fixing supper, cleaning the bathroom or building with egos. It builds relationships and without relationships there is nothing to encourage you to communicate! Since our oldest was a baby (she is 11 now), we do a bedtime routine that has all 5 of us together in one of the kids rooms, reading a Bible story, praying together, and singing. We are teaching our children hymns so often they pick a hymn and we sing that but we always end with “Jesus Loves Me” with a modification of singing the children's names (Yes, Jesus loves me, yes, Jesus loves E…, A… and J…., Yes Jesus loves us,….). After 11 years it is now more of a tradition and though some nights it would be easier for Dad to do it while I tidy up, or I do it while he does some tiding, it just isn't the same if we are all in the house but not together in those 20 or so moments each night. With differing bedtimes now, we still make it a priority to be together before the youngest goes to bed.